Funny how life takes you down unexpected paths, isn’t it? I never thought I’d be here. Forget the random nature of how my modeling career came into my life at age 13…I never in a million years thought I would go to Haiti and fall in love. Not with a person, but with an idea. A concept that my now soul sister, Julie Colombino came up with. I first learned about REBUILD globally in the summer of 2014 when I traveled to Haiti with an amazing program called English in Mind to help adults in the Port au Prince community become more comfortable with the English language. REBUILD globally, founded in 2010 in response to the earthquake, is a nonprofit organization that was determined to help people get dignified jobs so they could recover from the devastation. Their solution: making flip flops out of discarded tires found on the streets of Port-au-Prince. By 2014 and after several years of revisiting, remodeling, and revising, REBUILD created a pretty incredible collection of ethical products. All products are made in Haiti by craftsmen and women REBUILD globally has trained and employed and every purchase directly contributes to the livelihoods of the artisans that make the sandals totes, and accessories. It is not charity — it is work. It is dignity. It is products made with love and pride, and purchases that uplift an entire community. Here was the only thing: I live in New York. Ask pretty much any New Yorker if they wear flip-flops and you will usually get a funny face. So, since increased sales meant the success of this employment opportunity, I teamed up with REBUILD, with the artisans, and with a local shoemaker to create a new design — the Bel Nanm sandal. Walking around in those brought a lot of attention when I went to shoots, went to castings, or was even just walking around the city. 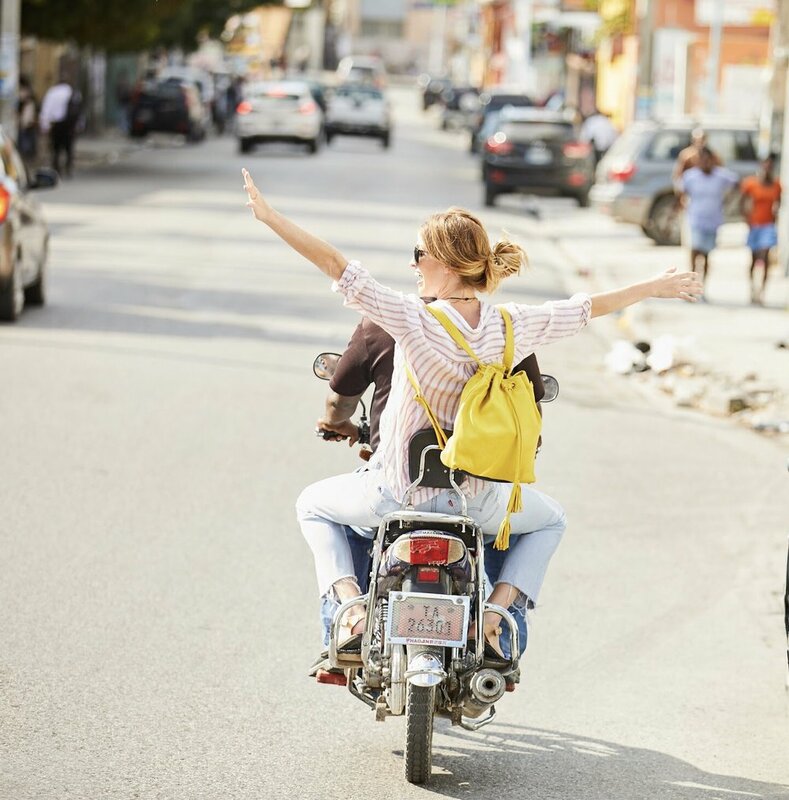 One of those instances even led to Brian Sassmann, a highly respected fashion photographer, coming down to Haiti with us and shooting our new campaign. In Haiti designing sandals with Jean Robert, a shareholder and manager of deux mains designs. We needed to get these shoes into the hands of those in the fashion industry! If enough people pushed it to the right crowds, the sales of these new sandals would take REBUILD globally to the next level! Funny enough, during my time with them in Haiti, they reached a whole new level on their own. After of year of lawyers and paperwork insanity, deux mains designs, the Haitian for-profit company that REBUILD incubated and launched, was up and running! What started as a non-profit, as aid, transformed into a social business ecosystem. It was a HUGE moment! I actually read a quote recently that reiterates why this was such a big deal. Dignity lies not in taking aid. Dignity lies not in taking a second pair of shoes when a more affluent human buys the first pair. Dignity lies in being able to send your kids to school. Dignity lies in having health insurance for you and your family. Dignity lies in having the ability to buy your own shoes. There is absolutely a time and a place for aid, most poignantly after a disaster. Haiti’s disaster, the earthquake we all remember, however, was over ten years ago. In the steps of recovery after something like that wreaks havoc on a nation, Haiti is now in the phase of rebuilding its economy — a phase which centers itself around job creation and self-sustainment. deux mains designs is a dignity project …and a sustainable one at that. But back to getting these Bel Nanm’s into the hands of the fashion industry (the world I’ve grown up in the for the past 15 years). We wanted to have a little party. We wanted to invite some people in the fashion industry to come check out our new line of shoes. 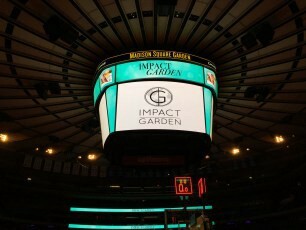 Then the giant beating heart of Madison Square Garden got involved and what started as our little project, turned into a night celebrating 15 other artisan brands that are creating their own “dignity projects” around the world — a mission that came to be known as “Impact Garden”. No small undertaking. 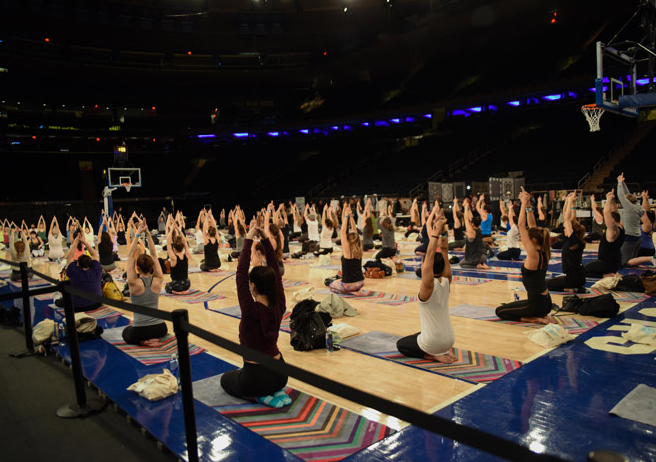 But….that’s what it’s all about: groups of people coming together to make the seemingly impossible, possible. That’s the most beautiful thing I’ve seen as I’ve grown to know social businesses and see their work. I stated it in an Impact Garden interview…I found that to be the magic of the evening: it was all different companies with variations of the same mission, working together for good. When we can combine forces, we are so, so, SO much more powerful than as individuals. So much good in one evening…so much impact spreading out like branches of a tree, quite literally across the globe. 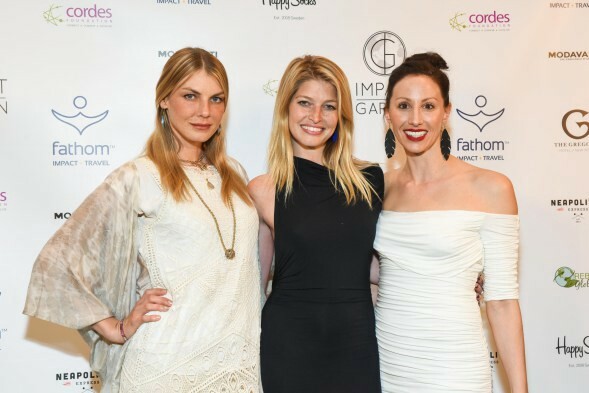 That is the direction that I hope Impact Garden continues to travel in…there is no reason on this planet that we should not all strive to do good things for others while taking care of ourselves, our own companies, our own families. Then, by empowering those in developing countries, they can empower those in their own communities, and the goodness travels on. It’s self-fulfilling. And it all started with a pair of shoes…a pair of shoes that now creates impact across the globe with every step you take in them.